BEAUTIFUL CONDO BUILT IN 2008 WITH 3 BEDROOMS AND 2 1/2 BATHROOMS, THE HALF BATHROOM CONVENIENTLY LOCATED DOWNSTAIRS, TOTAL CONSTRUCTION 1394 SQ. FT. OPEN FLOOR CONCEPT WITH A GORGEOUS KITCHEN WITH GRANITE COUNTER TOPS, ALL APPLIANCES STAINLESS STEEL AND INCLUDED THE REFRIGERATOR,PLENTY STORAGE SPACE. LAUNDRY AREA DOWNSTAIRS WITH STACKABLE WASHER AND DRYER INCLUDED AS WELL, TILE AND CARPET THROUGHOUT THE WHOLE HOUSE. 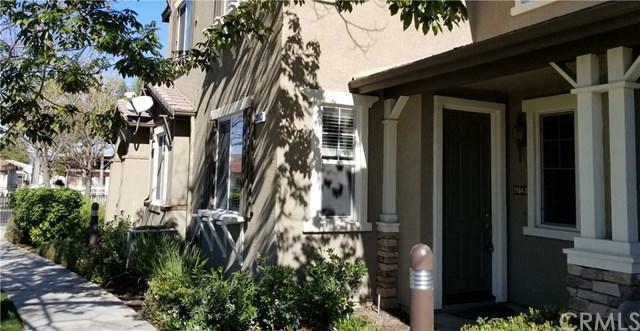 ALL 3 BEDROOMS AND 2 FULL BATHROOMS UPSTAIR, FIRE SPRINKLERS SYSTEM INSIDE THE HOUSE,TURN BEAUTIFUL CONDO BUILT IN 2008 WITH 3 BEDROOMS AND 2 1/2 BATHROOMS, THE HALF BATHROOM CONVENIENTLY LOCATED DOWNSTAIRS, TOTAL CONSTRUCTION 1394 SQ. FT. OPEN FLOOR CONCEPT WITH A GORGEOUS KITCHEN WITH GRANITE COUNTER TOPS, ALL APPLIANCES STAINLESS STEEL AND INCLUDED THE REFRIGERATOR,PLENTY STORAGE SPACE. LAUNDRY AREA DOWNSTAIRS WITH STACKABLE WASHER AND DRYER INCLUDED AS WELL, TILE AND CARPET THROUGHOUT THE WHOLE HOUSE. ALL 3 BEDROOMS AND 2 FULL BATHROOMS UPSTAIR, FIRE SPRINKLERS SYSTEM INSIDE THE HOUSE,TURN KEY CONDO. BEST LOCATION IN TOWN, CLOSE TO TYLER MALL, SCHOOLS,KAISER PERMANENT HOSPITAL AND CONVENIENT ACCESS TO 91 AND 15 FREEWAYS. 2 CAR ATTACHED GARAGE AND A LOT OF PARKING SPACE FOR VISITORS. **COMMUNITY AREAS OFFERS 24 HOURS SECURITY,GATED POOL AND SPA AREA WITH A LOT SEATING SPACE,PLAYGROUND AND PICNIC AREA BEAUTIFUL LANDSCAPED** !!! A MUST SEE PROPERTY PERFECTLY LOCATED !!! SELLER MOTIVATE !! !TERMITES CLEARANCE COMPLETED !!! Listing provided courtesy of Better Homes And Gardens Real Estate Champions. Listing information © 2019 San Diego MLS, Inc.